While the overall design is unpretentious and simple, the Tucson Bar Stool from Woodard offers exquisite style. 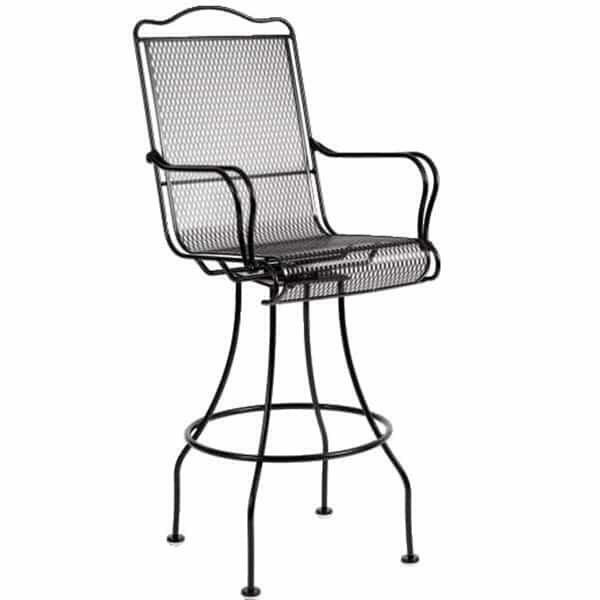 Unlike other patio furniture bar stools, this model is ornate in the details, yet is not excessive, with slender and slim wrought iron serving as the base. The crested top rail and curved, looped design will garner compliments from all guests, while the mesh backs and seats are comfortable. Wrought iron has been used for centuries in garden furniture, but typically is bulky, heavy and prone to rust. This bar stool avoids these issues, offering the slender frames and a futuristic finishing process that involves ionized rust inhibitors and sealers to keep out water. W 22.5" x D 24.5" x H 49.7" LBS 44 SEAT HEIGHT 30.3"